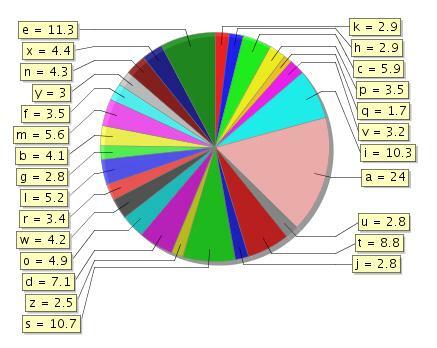 Revisiting the Google Alphabets Wheel: Google Index Size Is Shrinking ? Back in July 2006, we created the Google Alphabets Wheel based on the number of organic search results returned by Google for each English Alphabet. At that time, Google returned 24 billion documents containing the alphabet "a" while just 1.7 billion results for alphabet "q". Let's revisit the wheel to get an idea of how the Google search index has changed over the past seven months. Though it's a no-brainer that Google's index size has grown tremendously during this time, you'll be very surprised to learn that Google reported much lower figures this time. 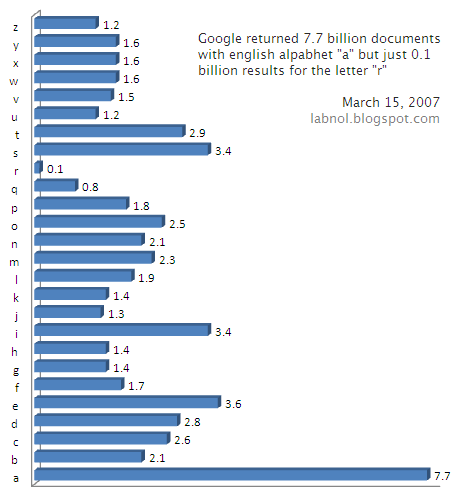 For instance, Google returned just 7.7 billion documents for the letter "a" which is just 30% of the earlier value. Also, there are just 0.1 billion documents in Google's cache with the letter "r" and this number was 3.3 billion in July 2006.